This week I’ve got a couple of items to cover and first up is an Internet browser which is new to me, at least. It’s called Opera and has been available for years, but I never bothered because it cost money in an era when other browsers were free. It has been very popular on mobile phones but I hadn’t encountered it, not being a mobile Internetter. I recently saw that a new version had been launched and, having a couple of minutes to kill, I went along to opera.com to have a look. Somewhere along the line, they stopped charging for what is a capable, good-looking piece of software. The new version, Version 10, is not quite as minimalistic as Google’s Chrome browser, but its interface is neat and clean and it looks very smart. It does the normal web browsing thing very well and has plenty of extras built-in, like a Bit-Torrent download capability, just for starters. It also has a built-in notepad which you can use to take notes as you hop from one website to another, or which can be used for other purposes like keeping to-do lists, or whatever else takes your fancy. Opera allows you to install widgets (or small programs), of which there are a large selection, ranging from games to clocks, and much else besides. Opera also includes a capable looking e-mail and news client which will operate with both POP3 and IMAP-based e-mail systems. The IMAP capability lets you to use it in conjunction with services such as Google’s Gmail or indeed, with Operas own web-based e-mail system. It has a feed reader, which will allow you to subscribe to websites that provide feeds, and keep you up to date when new material is added to any of the sites that you have subscribed to. Unusually, Opera has a voice control feature, which allows you to control the browser with the power of your voice alone, and it’s certainly going to be interesting playing with that. It has a feature which will remember your website passwords and fill them in, at a click of a button, whenever you visit a site requiring them. The feature will also streamline filling online forms by automatically entering personal details, such as e-mail and postal addresses, into web-based forms. It’s too early to say whether I’m going to make the switch to Opera, but my preliminary impression is that it is a very capable browser and more polished and complete than most of the other options. I had hoped that talking about Opera would expand into an entire column but, seeing as I have some centimeters left to fill, I thought I would go into some interesting websites that you might possibly visit using Opera, or your favourite browser. The first one, courtesy of Sky News, was an ongoing auction on eBay (ebay.co.uk) in which one million frozen mixed fruit pies were being sold off to the highest bidder. The 1,090,000 pies, occupying 130 pallets and needing five articulated trucks to carry them, had then received 208 bids, with the highest being for £125,300. Bidders were warned that the winner would have to come and fetch their pies. And I thought I had seen everything! The other site worth visiting is detouch.org which shows off the work of a variety of beauty retouchers, who take pictures of already attractive women and manipulate them to make the models look better; or just different, it might be argued. The site has a very nifty Java application built into it, which allows you to select from a stack of options and shows you pictures before and after retouching. I have to say that I was amazed at some of the examples shown, which range from skin smoothing, whitening of teeth, brightening of eyes and the elimination of stray wisps of hair, to much more elaborate retouches. Eyebrows are shaped, excess poundage is removed, certain features are plumped-up, and even dramatic shadows and makeup are added. It certainly gives you a new perspective on the beauty and fashion shots that feature so often in popular magazines. Those ladies are definitely not as perfect as they might seem. Why not leave a comment by checking the link below? When I can’t actually be out taking pictures, I am very often to be found looking at them, and one of my most frequent online destinations is the photo sharing site Flickr.com. It’s where I display my personal pictures and regularly check in to see what friends and contacts have been up to. This column is not about us individual photographers however, but about organisations who are using the site to post their pictures. 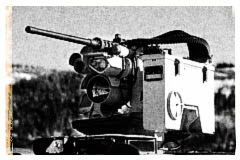 Quite by chance, I came across pictures posted by the U.S. Army Materiel Command, which included the greatest inventions of 2008, and showcased the XM-153 Common Remotely Operated Weapon Station. I challenge any man to see this thing and not have visions of setting one up to cover the approaches to his house, and using it to blow away the baddies as they come sneaking up the driveway. Anyhow, my interest was aroused, and I went looking for other organisations using Flickr to host their pictures. There is no direct way of searching for these, but I did find quite a few including the US Marines, who post a variety of current pictures. Another is the media section of the NATO International Security Assistance Force in Afghanistan (ISAF) and, although I should be getting used to the Internet by now, I still find it incredible viewing pictures taken the day before in a war zone halfway across the world. Moving away from organisations for just for a moment, I also discovered that one can find collections of pictures on Flickr on just about any topic, by entering a key word into the search box. I managed to find pictures on such diverse subjects as Camp Bastion, Hurricane Katrina, the aftermath of the attack on the World Trade Centre on 9/11, and the London Eye. But back to the topic, I was surprised to find that there are a number of heritage institutions using it to post sections of their photograph collections online. These include the Library of Congress, the Smithsonian Institute, the Imperial War Museum, and an apparently growing number of others. They have a dual motive in posting their pictures to be viewed by a wider audience. The first is to share their pictures, which such institutions like to do, and the second reason is that the viewers might know more about the pictures than the institutions themselves, and contribute this knowledge. One amusing thing I found in the Library of Congress collection is a colour picture of a couple of people hanging out backstage at the Vermont State Fair in 1941. Off to one side, there is a young boy kneeling with his back to the camera. There is speculation in the notes on the picture about what he might have been up to. One commenter said he was probably playing with matches, because he looked like her twin brother had looked, as he set fire to their mother’s trailer home. The pictures in the Commons are displayed on condition that there are no known copyright restrictions on them. They may be in the public domain, the copyright holder may have decided not to enforce copyright, or it may be unknown if there is a copyright holder. I’m no legal expert, but I interpret this to mean that you are broadly safe to use the pictures for your personal purposes, but you might find trouble if you started selling posters, and the copyright holder suddenly appeared. I had meant to do this column on a completely different subject, but when I sat down to do my Internet research, I was distracted for hours by all the interesting pictures I found in the Commons. They covered all manner of subjects ranging from a group of workers in an Australian cake shop in the 1930s, to a glamorous picture of a woman, apparently used in a cigarette advert. And, if you don’t get distracted by something like that, you have no soul. One of the most vexing questions that faces online publishers these days is just how to make the Internet pay. Internet users are notoriously resistant to paying for content and there are only a few publications worldwide, which have managed to get their users to do so. The publishers have all more or less been forced to establish an online presence, where users can access some or all of their content, and rely on advertising to make it pay. In the medium to long-term future, Google has plans to provide a platform whereby publishers will be able to charge small amounts for users wanting to read their material. The theory is that web users would be prepared to pay a small amount to read published news and views. So far, it has been impossible to collect very small amounts of money from lots people, because finance charges are prohibitive. All that’s in the future, if it ever happens at all, but Google recently launched a new site which is intended to help content publishers (and Google) make a profit from their content. The new service is called Google Fast Flip and presents news from participating publishers on one easy-to-navigate page, and shares the advertising revenue with the publishers. I went along to the site at fastflip.googlelabs.com and found that here are more than 40 publishers who have signed-up to the service, and whose stories are displayed on the site. These are displayed in the form of thumbnail pictures of the story page on the publisher’s own website. The stories are grouped by section, topic, publication, and can also be ranked in order of Most Recent, Most Viewed or Most Recommended. You can click on any story that interests you and you are then shown an enlarged picture of the page containing the story. The pictures are large enough so that you can read a couple of paragraphs, to get a sense of whether you want to read any more. On the page is a link to the publisher’s website, where you can read the whole story if you want to, and a couple of adverts. Google is hoping that, while you’re viewing the page on Fast Flip, you’ll click on one or more adverts. Every time you do, Google’s cash register will go ‘ka-ching’ and the advertiser will have to pay up, because you’ve looked at their advert. Just as a supermarket collects consumer goods together to make shopping quicker and more convenient, Google is acting as a news aggregator and making it quicker and more convenient to get your news online. Content publishers have so far tended to get very hot under the collar at the thought of their content appearing on other websites, even if in abbreviated form. This is why I think that Google model, where they are paid a share of revenues, is going down much better. Fast Flip is a very interesting idea and it certainly does make it easy you for you to see at a glance what’s happening in the world, and to get up to date quickly on whatever topic happens to take your fancy. I think that it is going to be a very useful tool and, even though it offers mainly American publications at the moment, I’m sure we’ll soon see more international ones joining in. It was pointed out to me recently by a chirping reader that I had been devoting a lot of attention to image and photography-related to topics in the last little while. In the interests of providing broad-based coverage, this week I’ve got news of a rather spiffy online service called Zoho. It’s a suite of online applications that you can use, either as an individual, or as part of a business, and is similar in many ways, to other offerings such as Google Apps. I went along to www.zoho.com to see what it was all about, and the first surprise came when it didn’t insist that I create an account for myself, but let me sign on using my Google account. It will also let Yahoo account holders sign on, and get to work right away. Whether you create a new account, or sign in with an existing one, you will end up at your personal page where you will be able to access all of the online applications that are available. These include e-mail, a wordprocessing package, a spreadsheet package, a presentation program, a calendar, a notebook, and a task list. For the business user, there is a customer relationship management, or CRM, program, an online meeting program, an invoicing program, and even a program which can be used for vetting applicants for a job. Zoho has an astonishing range of programs and add-ons that the individual can use for free, and you get 1GB of free storage space to play with. For business use, the price is not high for access to most of the applications, with 20 users plus 50 GB of online storage costing $50 a month, and 200 GB of space for only $30 more per month. There are additional charges for the use of the more heavyweight programs, such as the CRM, database and project management package, for business purpose. Even these charges are not high and compare very favourably with the cost of buying an office suite and additional softwarevfor all your users. I found that it is easy to navigate your way around the available applications which are listed on the left-hand side of the screen. One of the most useful that I found was that desktop, or dashboard, which displays your new messages, a list of documents, your outstanding tasks, and your calendar, all in one easy-to-view screen. I didn’t have the time to try out all the applications in the Zoho stable but I did take Zoho Writer out for a spin, and found it to be a very capable word processor. It has all the usual features including tables, bullets, indenting, and all the rest of it. There is a reasonable choice of fonts included with it, and it looks very easy to store documents, and find them later. My conclusions should not be seen as definitive at this stage, but it does look as thoughZoho would be a viable tool for private single users and groups in business. On the plus side, it does seem very capable and complete and it has the benefit of being free for individuals, and reasonably priced for business. It is hosted on the Internet, which has the plus that your data is stored well away from any disasters which might overtake your PC or network in the home or office, but there is the negative that we’re in South Africa. Whether our Internet connections are reliable and cheap enough for a business to use Zoho for all its day-to-day computing needs, is a matter only the business can decide. The other slight negative is that Zoho’s help feature and explanatory text is not quite as clear as it might be. I occasionally found it difficult to find the information I was looking for and there were a couple of things referred to in the help, that I still couldn’t see how to do. It is also clear that some of it has been done by persons whose first language is not English. This slight drawback will probably be compensated for by the support forums which you can use to get answers. Many other Web services have forums where you find that questions go unanswered but, with Zoho, I can’t say that I found any questions which were not answered and resolved to the satisfaction of the user. At the moment, I am not that tempted to move all my e-mail and few online documents over to Zoho from Google, if only because you get more free storage space with the Google Gmail offering. On the other hand, if I were running a business and decided that hosting my software and data on the Internet was viable, I would give Zoho a very close look. Gene Kelly sang Gotta Dance in the immortal musical Singin’ In The Rain. I know how he must have felt because I often get the feeling that I Gotta Publish something. I have published a book, various websites, these columns and yet, it seems, that is not enough for me. For some time now, I’ve been having the urge to do a Blog on photography even though I’ve done my best to resist by reminding myself that the last thing I need is more time spent in front of the computer. That didn’t work and I soon started considering how, rather than whether, to go ahead with it. My usual blogging platform it is a Blogger, where these articles are kept in an archive and, while I’ve got nothing against it, I was starting to think that it is a little less professional than I would like. One blogging service that crops up often nowadays is WordPress which offers anyone free blogs at www.wordpress.com. You get 3GB of storage space for, which will hold a whole lot of words, and you can upgrade that for a nominal amount. The sign-on process is very quick and once you have an account, you can go ahead and create a blog which will end up like end up having an address like http://allanjackson.co.za/fn/, to pick a random example. There are a large number of layouts (or themes) to choose from to give your blog the look and feel that you want. You also get integrated statistics which tell you exactly how many people are viewing your blog, a list of people linking to your blog, and you get can import existing blogs from other locations, including from Blogger. One very handy feature that WordPress has is static web pages which can be linked from your blog’s header or sidebar, and which don’t change as you update the blog’s pages. This feature fixes one of the great lacks that I found in Blogger, which is that everything is filed in date order and there is no direct way of keeping pages, such as a biography for example, near the front. The key to using WordPress is the dashboard which is an admin page that allows you to view all the information to do with your blog. It is where you create and edit pages and blog posts, change the appearance of the blog, choose a new theme, and much else besides. I had a quick look through the list of templates that are available and picked out a very clean and uncluttered black-and-white layout, which suited me perfectly. That particular theme allows you to add a picture to the header section of your page which I did very easily because it told me exactly what size to make it. I found the WordPress interface to be really smooth and easy to use and I had a professional-looking blog site up and running in a short while. The first post took an additional couple of minutes using some text I had created and a picture from my online Flickr account. The interface for creating and editing posts and pages is like a basic word processor which you use to enter text, apply formatting or insert pictures, video clips, or whatever. Pictures can either be uploaded from your computer and stored in your web space or you use pictures stored elsewhere on the Internet, such as in Flickr. WordPress is a very easy but powerful publishing tool which would be ideal for keeping a day-to-day blog, or a much bigger website. I don’t intend to remove my current blogs from Blogger, but I must say that I very much prefer the features and power of WordPress. I have been on the Internet for a long time and have used it time out of number as source of information and entertainment. I never quite got the social networking aspect of it until fairly recently. The light began to dawn when I started to play an active role on photo sharing website Flickr.com. I had been a member of Flickr for quite some time and was using it to display some of my photographs but hadn’t taken it much further than that. Things changed when I managed to persuade some fellow members of Hillcrest Camera Club to get Flickr accounts and we soon began sharing pictures online. The system is cleverly set up to display new pictures, which have been uploaded by your contacts, on your home page and I found that wasn’t at all long before Flickr was my first stop on the Internet each morning, and quite often, the last one at night. It is very interesting, after having gone on a photo outing, to get back home and then, over the next couple of days, to begin to see the pictures taken by other members of the club appearing in our Flickr group. The next thing we discovered was that there was another group on Flickr, called the Durban Flickr Meet Up, who were about to have an outing of their own to the beachfront. A number of Hillcrest members went along on that outing, had a wonderful time and, instantly, our circle of local photographers expanded. We have since been on a joint outing to the Moses Mabhida Stadium, and there are many more in the pipeline. I then got to hear of local photo magazine Pix’s website which also allows you to network with other like-minded photographers. It turned out that they also had a Durban and KZN Group, who were just getting organised, and about to start organising their own photo outings. The social highlight, so far, was last weekend’s Scott Kelby Worldwide Photowalk on 18 July, when over 30,000 photographers in many cities around the world went on a Photowalk. There were 50 Durban photographers and we had a very successful walk, starting at dawn, from Wilson’s Wharf to the Bat Centre, and back. For security reasons, the SAPS weren’t keen to see us photographers busily recording views around the bay but they soon threw their hands up in despair when confronted with the impossibility of controlling 50 leather-stetsoned people out having fun. We should have had some I-AM-NOT-A-TERRORIST signs but, as it was, I have had my picture taken playing the Lying Down Game (see here), which is gaining popularity all over the Internet. Social networking is working for me so far and I’d recommend it. As with most things in life, however, one does have to be a bit careful about what one gets up to. If you are a teenage girl, for example, it would most likely be unwise to run away to South America with someone you meet on the Internet. This person doesn’t love you and you will end up working in bordello, wherever you happen to end up. I’ve even been doing a bit of Facebooking lately, but I must confess that one thing I still don’t get is micro-blogging site Twitter, and I doubt if I ever will. It’s probably a bit like Tom Waits music in that regard; not a taste I’m likely to acquire. Why not click the link below to leave a comment? E-mail has become one of the most vital communications tools that most of us use every day. For this reason, e-mail has featured often in these columns, and today I’m going to return to the subject to discuss my ongoing adventures with Google’s Gmail service. I’ve been using Gmail for a couple of years, since it was available by invitation only, and have found it to be an extremely valuable addition to my computing arsenal. The move away from an e-mail package based on my desktop computer at home has proved invaluable over and over again, seeing that I can now access my mail from wherever I happen to be. The only nagging doubt I had was that I didn’t have way of backing up my e-mails, stored on Google servers, and was therefore totally dependent on them to keep everything safe and sound. I searched high and low for a means of backing up my e-Gmail and eventually came up with the fact that Gmail does allow IMAP-compliant e-mail clients to access the system and download all or part of the email stored there. I eventually settled on the Thunderbird e-mail client and the full story of that is documented in a previous column, which is available here. The solution worked very well and I was able, not only to download messages from Gmail, but to have Thunderbird copy messages that I had created locally to my Gmail account. Then came the terrible episode when my hard drive was accidentally toasted during a computer upgrade, and I was forced to go back and recreate everything that I had done over the last couple of years. The Thunderbird-IMAP solution was very workable, if a trifle fiddly to set up, so I decided to go out and see if there were any new ways to back Gmail up. The first thing I found was a program called Gmail Backup, whose name gives you a very accurate idea of what it does, and it does simplify the matter of creating a backup of all your Gmail messages. The program is free from gmail-backup.com and it will download your e-mail messages so that you have a copy of them safe on your local hard drive. It is a work in progress and only gives you a straight choice between backing up all your messages or just those from before or after a particular date, or between two dates. Gmail Backup sounds very useful and, if you only need a simple backup, it sounds as though it would be fine for that. I wanted a bit more and I was looking around for another solution which would give me the backup facility, and also allow me to use Gmail on my desktop computer if Gmail was ever offline, heaven forbid, or my Internet connection wasn’t working. Quite by chance, I came across a browser add-on called Gears, which was developed by Google, and is compatible with most modern browsers. It allows you to use certain websites even if you’re offline and, Gmail’s case, it stores a copy of your messages on your local computer so you can access them when you’re offline . This sounded like just the job to me, so I went along to the Gears site at gears.google.com and downloaded the program for use with my Firefox browser. The next step was very simple and meant going into my Gmail account, going to the Labs setting under settings, and switching on the Gmail Offline facility. No sooner was that done, than Gears and Gmail started talking to each other and Gears started downloading my messengers to the hard drive. At the time of writing, Gears said it had downloaded all my messages, but that it had still had 2856 attachments to download. It’s early days to comment on Gears and Gmail’s offline facility, but it does look very promising. I have noticed that Google is usually very careful about making sure that its various bits and pieces work, before releasing them on the unsuspecting public. More to follow in future columns. Last week I spent quite a lot of time looking at a website looking brimming with tips on how to improve your life by getting things done quicker and more efficiently. I spend so much time, in fact, that I almost didn’t leave myself with enough time to get the most important thing done, this column. The website is called Life Hacker (www.lifehacker.com) and does have a strong computing flavour about it but it also has an idiosyncratic selection of articles on various other subjects ranging from how to prepare an infused olive oil, to making a revolving rack for your tins of food. One of the interesting computer articles which I read was written by Life Hacker founder editor Gina Trapani, who says that you can easily keep your e-mail under control by using what she calls the Trusted Trio of mailboxes, or folders. She says that most of us spend far too much time filing our e-mails based on the subject of the e-mail, the person who sent to us, or any number of other criteria. She believes that the secret to keeping on top of your e-mail is to scan it on a regular basis and complete any tasks arising, that can be completed in less than a minute. Apart from that, she believes that you should only have three other mailboxes in addition to your inbox, which she labels as Follow Up, Archive and Hold. Messages that require you to do something which is going to take you longer than a minute should immediately be moved into the Follow Up box and you should regularly go through them and complete the tasks that arise from each. The Hold box is a temporary holding station for messages that you want to keep around for quick reference. Examples of this might be a tracking number from your latest Internet purchase which you will no longer need after the package arrives. The Archive mailbox is for the long-term storage of all the messages that have been dealt with or are no longer required in Hold. Gina makes the point that the search facilities that we have available on our computers today make it unnecessary to file all our messages in the elaborate and time-consuming ways we used to. I hadn’t really thought about e-mail in these terms but using the Trusted Trio does make perfect sense and sounds as though it would save a lot of time. Another recent article on Life Hacker concerned their Top 10 Tiny and Awesome Windows Utilities which all seem potentially very useful to those of us who spend a lot of time in front of our computers. One that I have tried is called Revo UnInstaller, which can be downloaded free from revounistaller.com, and which provides a lot of useful looking tools for Windows computers. The most important of these is the Uninstaller which you use in place of the one provided in Windows, to properly uninstall programs that you no longer need. Once you’ve selected a program to uninstall, Revo activates the program’s uninstall feature, as Windows does, but it also searches out files and registry entries left behind by program. I tried it a couple of times and the process seem to work very well. Other facilities offered by the program include one that deletes junk files from your computer, one that cleans the history and temporary files from your browser, and one which makes it impossible to recover deleted files, which would be useful from a security point of view. Life Hacker is a very interesting website and one that I’m going to keep my eyes on for sure. In other news, I was having a look at a British newspaper, over the Internet of course, and I see that the firm previously known as British Telecom, now BT, has announced that it is providing Internet connection speeds of 60 megabits per second to many areas in the UK from the beginning of 2010. This is apparently eight times faster than the previous fastest speeds offered by BT and they apparently plan to jack that up to 100 megabits per second by 2012. It’s enough to make me cry, slaving away night after night over my hot computer trying to download podcasts at a measly 384 kilobits per second and finding that many of them bomb out halfway through because of server time-outs, or whatever have you.